Experience the majestic beauty of South Carolina's Treasured Coast on Hilton Head Island. From lone reeds swaying in the marsh breezes to the flat, sandy beaches along the Treasured Coast to the thick forests of tall pines and live oaks, Hilton Head Island's pristine beauty and protected ecosystem of wild foliage and animals is a nature lover's paradise. Enjoy a variety of outdoor activities year round on Hilton Head Island and take advantage of warm temperatures and salt air. Golf at any one of over two dozen courses, some with views of the Atlantic Ocean. Kayak the tidal waters of the coast and see wildlife up close or go fishing in our ocean waters. Sail the bay waters of South Carolina and watch the dunes roll into the horizon. Or, hike beaten trails and lose yourself in the beauty of the Carolinas. Explore the natural wonder of nature and the outdoors. The Hilton Head Island outdoors experience is one like no other. Revisit nature at one of Hilton Head Island's nature preserves. Visit the Newhall Audubon Nature Preserve and view the natural flora and fauna of the Island. Find wildlife at Pinckney Island Nature Preserve, a former lookout used by early settlers. Walk the last remaining tract of undisturbed land on Hilton Head Island at Sea Pines Forest Preserves. Explore a 4,000 year-old Indian Shell Ring. Or, visit one of many registered historic landmarks designated by the National Register of Historic Places. 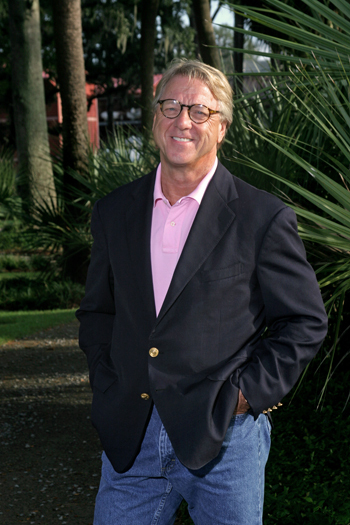 Listing of Hilton Head Nature Tours. Hike, bike and wander designated paths on the Island bordered by plants, wild animals and marshlands. Each trail leads to a point of interest on the Island. Explore trails from sunrise to sunset. Or, cross the bridge to the Main Trail on Pinckney Island. The 3.5 mile trail is completely bordered by water and watched over by dolphins and alligators. Birds and foliage spill onto the trail in some places making the experience even more spectacular. All trails are suitable for walking or careful biking. One of the most popular activities while visiting is cycling. 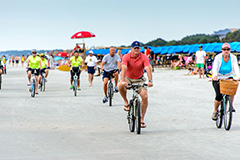 With miles of both paved and dirt paths covering the Island, there isn't a place visitors can't go with their bikes, including the 12 miles of sandy beaches. Listing of Bicycle Sales & Rentals & Bike Tours. Hilton Head Island natives also include deer, bobcats, otters, minks and even a few wild boar. Of all the Island creatures, the bobcat proves to be the most elusive, lurking in the forest preserves and in the undeveloped parts of the Island. With great foresight, plantation designers in the 1950's set aside areas for an animal habitat, when the master plan for the Island was first conceived. This ingenuity and high regard for environmental preservation set the standard for resorts worldwide. To view these Island creatures in their natural habitat, guests can take a Lake and Forest Hayride, Horseback Tour or Walking Tour of the Sea Pines Forest Preserve. These informative, award-winning nature-based tours are ideal for families and can be booked by calling 800-SEAPINE. Several oceanfront resorts on the Island, such as Hilton Head Plantation, Port Royal Plantation, Palmetto Dunes or Forest Beach, are excellent places to see a bottle nose dolphin. 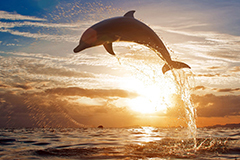 In the summer, dolphins are prevalent along the shoreline, where they feed on small fish and sea creatures. There are also many companies offering dolphin tours. Marine life study and dolphin-watching excursion cruises are available through several of the Island's public marinas and through Coastal Discovery Museum on Hilton Head Island. Protected wetlands make Hilton Head the place to watch shorebirds and inland birds. See Egrets, Sandpipers and Wood Storks. Look above to catch Sea Gulls in flight alongside Pelicans and Osprey Eagles. Hilton Head Island is a bird watcher's haven. According to the Audubon Society, nearly 200 species of birds flock to the lakes, marshes and shoreline of Hilton Head Island. However, more than 350 species of native American birds have been sighted on the Island over the past ten years. Among the most notable of species are the Snowy Egret, the Large Blue Heron and the Osprey, but bird watchers will also discover the White Ibis with its unique beak that curves downward. In addition, smaller Cattle Egrets that first arrived on Hilton Head Island in 1954 from their South American habitat may be observed following Island cows, horses and tractors. Whatever your family chooses, Hilton Head Island's opportunities for family fun are endless! Sometimes kids want to strike out on their own and take advantage of all the Island has to offer. When the simple pleasure of sandcastles is not enough, the Hilton Head Island offers myriad options for kids to pursue their own interests. From supervised recreation at the Island's resorts to specialized sports camps, there is a program that will satisfy every kid's personality and parent's peace of mind. The Westin Hilton Head Island Resort & Spa - This casually elegant seaside resort offers The Westin Kids Club for ages 4-12, a full or half-day program of activities including arts & crafts, trips to the beach or pool and the Westin Kids Club Discovery Room filled with it's own movie library and photo corner. Let the kids have a night on their own at Kids Night Out. Learn about local culture and traditions, island history, animals that live in and around Hilton Head Island and much more! Westin Kids Club program is available seasonally. Please call 843.681.4000 for more information. Crowne Plaza Resort - This AAA four-diamond resort offers camps with a variety of activities such as a vist to the WaterFun Park, kayaking (ages 6 and up), a dolphin cruise, bowling, or a visit to the Sandbox. Children 3-12 years are invited to join for a fun-filled day with games, arts and crafts, swimming and much more. Ages 3-5 years are welcome in the morning session from 9am-1pm; ages 6-12 years can join for a full day or half day.Lunch and/or snack provided. Pre-registration is recommended. Call (843) 842-2400x7620 for information. 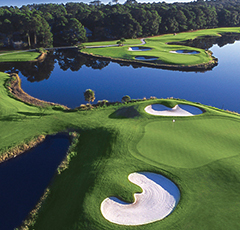 The Sea Pines Resort - This resort, situated on Harbour Town Golf Links, offers "Fun for Kids!" - a summer day camp for ages 4-12. Handpicked counselors entertain kids with bowling, putt-putt golf, beach games and a cruise every Friday to see dolphins in Calibogue Sound. Half and full-day programs are available from Memorial Day to Labor Day. For information, call (843) SEA-PINE. For kids who want a sports experience, Sea Pines offers a "Future Stars" Junior Golf Program for a fun introduction to the game by PGA Golf Professionals. Children also can benefit from the expertise of former U.S. Open and Wimbledon champion, Stan Smith, at Sea Pines Racquet Club, ranked number one in the nation for tennis programs by Tennis Magazine. For information, call (843) SEA-PINE. Island Playground Cardio Kids Camp (Drop off the kids and go shop at the outlets!) Morning Camps or Day Camps are offered June 2 - August 22. Island Playground is and indoor playground featuring inflatable fun and creative play for kids under 12. Camp activities include supervised free play on the inflatables and Imagination Stations, sports conditioning games and arts and crafts time. Please call (843) 837 - 8383 or visit web site for more information. The International Junior Golf Academy offers monthly and weekly boarding camps from mid-June through mid-August for ages 12 and up. Young golfers from around the world come for intensive instruction by PGA teaching professionals, a low student-instructor ratio and fun activities such as pool parties and picnics. Skip Malek, a “PGA Teacher of the Year,” directs the school. For information, call (800) 925-0467. For kids who want to indulge their creative side, the Arts Center of Coastal Carolina offers half- and full-day workshops in dance and theater with artists-in-residence, such as the cast of the summer's feature production. Call (843) 842-ARTS for more information.